You may have heard a lot about Marathons these past couple of weeks on the TypeRacer blog. And you may in-fact have questions, such as “How do you do a race in a quarter of a minute? How do you do 5,000 in a day?” Today’s blog post will clear a lot of those aspects up, and no-better person to do so than the one that just got up after an intensive 5,590 race Marathon (you can look forward to a blogpost on that later). To start things off: A marathon is the amount of races you complete in 24 hours. It doesn’t have to be a set time as it will always be matching your current race count from 24 hours prior. 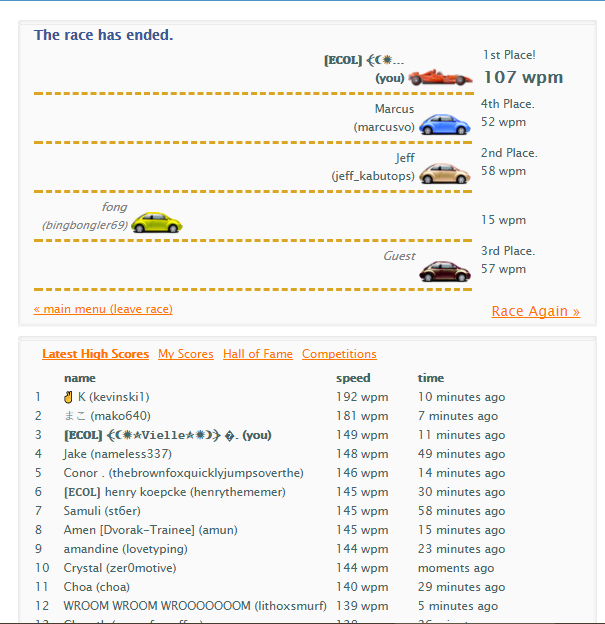 For as far as TypeRacer history has been concerned, most races have been done through the maintrack — i.e., the standard track you get when clicking “Enter a typing race” on TypeRacer.com’s default play.typeracer.com universe. The idea of racing on short-text tracks for optimal race efficiency hasn’t been thoroughly theorized and implemented until recently starting with Michael DeRoche – March 31st, 2017. And no, there is no secret real world where everyone is racing on and you are all racing in the matrix (yes fast typists I know how depressing it is racing one or two real people for hours straight as well as having to race bots); it is never often really a thought that there is a “maintrack” to differentiate with [when you Enter a typing race], but this does become a natural distinction that is made when you race on private Racetracks [with friends]. For reference, the most races you can get by doing this is 2,000 races. The only person shown to execute this is Michael Deroche. This is about 80 races per hour. Very doable, and relatively easygoing. If you do one race per-minute, then you will that you can do 1,500 races in that given timespan. All marathons outside of the top 3 are mostly done through the maintrack. Tip: You can click tab-twice then enter instead of having to manually click Race Again. Now we move on to Friends Track racing methods. As far as most people are aware, you just race with friends, while that is certainly not easily-arrangeable for extended periods of time, there is however – a solution. Thanks to Ted (who also does impressive work within the OpenSteno project; steno being attributable towards some of the fastest speeds on the site, one of them in-fact set by Ted himself!) we have a script that allows people to join races. All you have to do is install Tampermonkey. 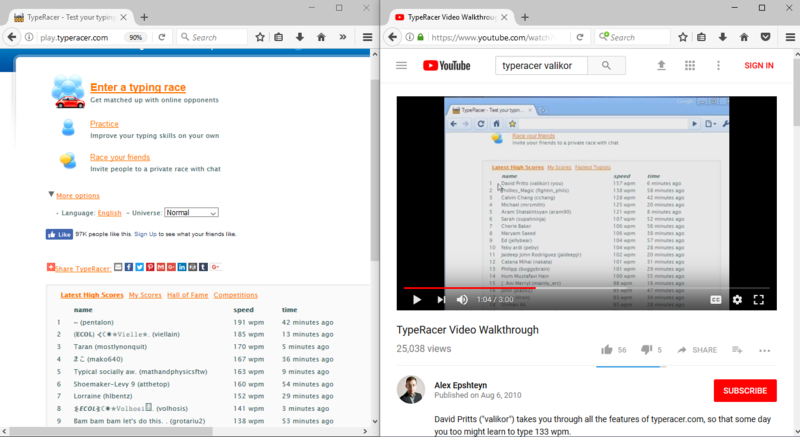 With the Tampermonkey script, when you go to TypeRacer you will notice it automatically joins a friend track and auto-joins your race. Now you don’t need friends! account/window that you plan to race on (you can do that through clicking on the icon and then disabling it). However we are forgetting something. As some typists may not be aware, TypeRacer “skill levels” dictate the length of texts that you type on TypeRacer. Therefore it is optimal if your friend’s account [or whoever is hosting the private race track] has a last 10 race average below 25 WPM [at Beginner level speeds]. This enables you to type the shortest texts — obviously a big help when trying to complete a lot of races in a short time. Once you now have race-track hosting window(s) in the background you will join all of them using the friends link and position them however you wish. With this you can get around 3,000 races at most, this math adds up to 2 races per minute. For reference I set a 3.8k Marathon record with only two different race tracks (joining the next race as soon as I could therefore stopping in the middle of the race). But you may question, why do you use multiple friend tracks if one is good enough? With only one you are forced to wait those 10 seconds, you bypass that by having another track that you can hop into immediately. But then it becomes cumbersome hence you start the race 2 races ahead of you once you just finished your race to keep the flow going. Tip: You may find watching videos or listening to music will make your races all the more faster – at least to make the time fly by faster. With this you can get up to up to ~5,000 races [in 24 hours] maximum. Assuming you finish a text every ~17 seconds. The last method towards perfectly refining your race optimization is ghost races. This however requires premium in order to save those ghost races. If all that sounds compelling, then do consider supporting TypeRacer [along with tons of more benefits!] by upgrading to Premium. Ghost races, when using the shortest texts, can prove to be hyper-optimal. Michael Deroche was able to attain 333 races in 71 minutes [4.3 races a minute]! You may find that navigating the texts may be difficult, but thanks to Pentalon’s Python script there is an entire directory of [current] ghost race links to make things easier. And if you are crazy enough to do so, you can open multiple links with a multilink program or app if you really need to refine your your marathon skills that much further. Now that you have a thorough understanding of the three-different methods to approach you can have a true feel of marathons that puts those truly impressive accomplishments into perspective. Higher-end marathons typically use a combination of Private Racetracks and Ghost races with minimal breaks/interruptions. If you do ever have any questions, then do check the Discord, the resource and place I had used to refine marathon techniques beyond maintrack marathons. I couldn’t be impressed by the welcoming hospitality [of the Discord], thoughts and research that went into the carefully attentive and productive responses that went into my questions. Or simply use the comment section down below and I will address those questions myself.